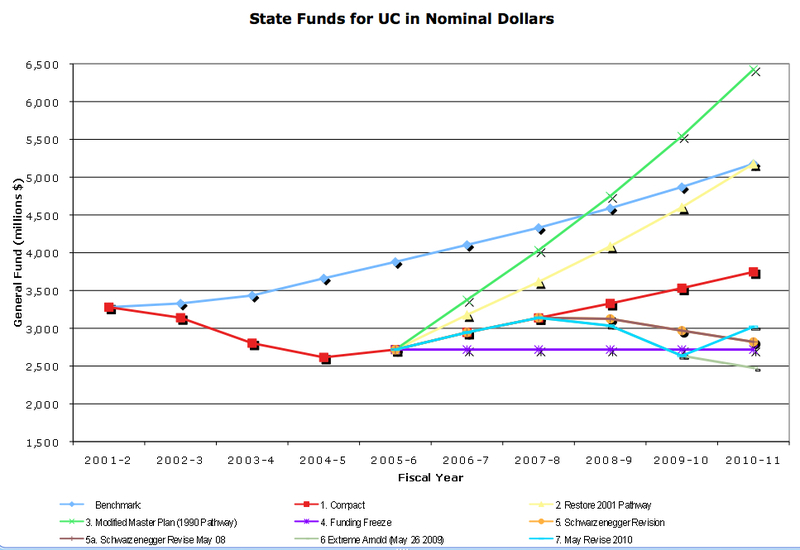 Last week's UC news of $500 M in untapped administrative savings eclipsed the real story, which is that like CSU, UC's state funding remains destructively low. I have updated the charts that continue to follow this story. I want to thank Maelen Haugen of UCSD and UCEAP Lyon for her particularly intelligent updating of our messy master spreadsheets. These 2 charts have minor errors (e.g. a Benchmark that doesn't dip in 2009) and will be replaced when I get back to my desk next week, but the overall picture is accurate. The standard funding model for higher education ties funding to state General Fund (GF) availability. When we produced the first version of this chart in 2005, we sought to change the framework for thinking about higher ed funding. We did this by calculating a 2001 Benchmark, the turquoise line sloping up, which was tied not to the GF but to aggregate state personal income. The Benchmark rises at a rate tied to the amount of money Californians actually earn. 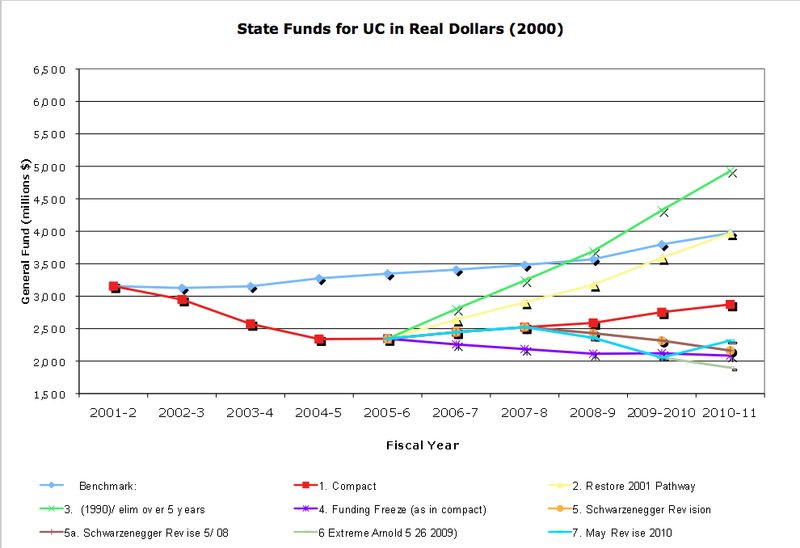 The Benchmark reflects UC's General Fund share when it simply does as well as the state's income earners - no better, but also no worse. The Futures Report and its heirs have discussed the other lines so I won't say much here - the green 1990 Pathway that is far over our heads, the orange Compact line which blocked recovery. There have been decision points along the way. The Senate officially recommended that the President ask the Regents to add $700 million to their budget request in 2007-08 as a way of getting back on the 2001 Pathway - growing with the state - while there was still time. This suggestion was not transmitted, seeming already to be a "non-starter" as one Regent's assistant told me at the time. The price of our "realism" can be seen in the Schwarzenegger snarl of falling lines. Purple was our worst-case scenario in 2005 - a public funding freeze. The May Revise of 2009 put us below that in the current year. We then have the turquoise bounce that is being heralded as good news by UC officials, which it is only in the context of cuts to other agencies. Note that it leaves us well below the Compact line -- which the Governor unilaterally abrogated in 2008. It also remains close to the worst-case scenario of 2005, which incidentally envisioned filling the budget hole with fee increases to $20,000 a year, not the kind of deep, steady cuts in service that we are seeing this year and next. When GF revenues are corrected for inflation, it is easier to see that we have ended the decade well below where we began it. Please note that we have not corrected for enrollment growth or for real cost increases tied to the Higher Education Price Index, but have used the lower Consumer Price Index for California. But this graph does give you a sense of why academic units all over the system are looking at 5% - 15% permanent cuts over this year and next, with no end in sight. The core problem with the current funding model - which Michael referred to as the hybrid model - is that it is and long has been unable to sustain correct levels of public funding. 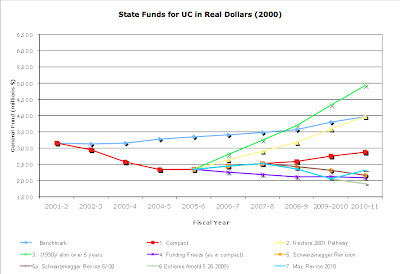 (1) the unlikely praise for Arnold Schwarzenegger's budgetary largesse to UC that suggests that the return of $305 million that he cut last year is a maximum rather than an only partial undoing of major damage. 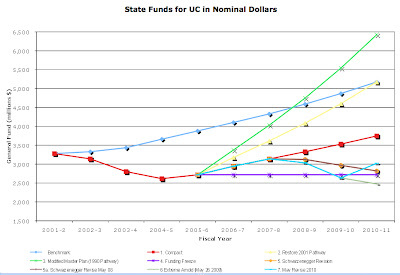 (2) the administrative savings initiative, whose inflated $500 million estimate implied that UC is sitting on a half-billion of waste, meaning that our next half-billion of recovery money can come from us rather than from Sacramento. Last week UC went backwards, not forwards. Next week I will offer more gruesome charts and outline better funding parameters. If some future historian comes to write the History of the Decline and Fall of the University of California she undoubtedly will puzzle over the administrations of Robert Dynes and Mark Yudof. The former’s problems were legion—from the Compact with the Governor, through myriad administrative scandals, to the alienation of the Regents and their increased efforts at micro-managing the University. The Yudof years are, of course, far from being finished. But certain characteristics are clear: a drive towards centralization and his dismissal of faculty and staff voices (for instance in his cavalier characterization of the university’s employees as the inhabitants of a cemetery) being the most obvious. Ultimately, however, these problems are symptoms of a deeper failing that cuts across both administrations: their inability to imagine a way out of the present crisis because their policies and assumptions are part of that crisis themselves. Indeed, the most striking characteristic of the last two administrations—and the Regents who have employed them—has been their inability to offer a compelling economic, ethical, intellectual, or political justification of the University and its social importance for our time. President Yudof insists that he is an admirer of the Master Plan—and I have no reason to doubt his sincerity. But the problem isn’t personal preferences. Far from seeking to transform the financing and rethink the nature of higher education as they claim, UCOP and its allies are simply proposing a more intensified version of an already failed system. The basic assumptions that President Yudof, UCOP, and their propagandists make about the way the world is actually reinforce the structure of business as usual. Because they are committed to a model that has failed American higher education they have been unable to defend the University effectively. The “hybrid university,” he insists, must accept that the decline in public funding is permanent. It must seek out new sources of revenue—from private donors, corporate contracts, and student fees—to compensate for this change. In effect, the hybrid university not only breaks with the centrality of public support, it also breaks with the centrality of the university’s public character. Public funding and the public aspects of the university’s institutional culture become means to leverage private funding, private support, and private commitments. This practical redefinition of the public from the heart of the university to a means of leverage helps explain UCOP’s continuing depiction of publicly funded parts of the University as drains on the institution’s finances while they laud privately generated funds as actual investments in the future. But President Yudof is not articulating a new strategy; he is merely renaming the strategy that public universities have been pursuing for two decades—and that has brought us to the present crisis. This pursuit of the “hybrid university” has brought us to a period of declining educational achievement, increasing inequality in access to education, and a death spiral of funding for public education. The hybrid university has been in place at least since the early 1990s. It is the financial infrastructure of the decline of American higher education. It is that reality that UCOP is unable to confront. To continue already failed strategies is not a rational plan—it is a recipe for continued decline. UCOP and its allies insist that the state cannot be brought back to its commitments and chide those who insist that it must for allegedly living in a fantasy world. But facing necessity is not fantasy—the strategies proposed by UCOP and its allies will not turn around the university because they are the strategies that have brought us to this point in the first place. Renewed public funding is not simply desirable. It is required. The efforts to finance the University through tuition and private endowments may alleviate the problem slightly, but they cannot solve it. As the “Futures Report” made clear, there is no way to compensate for the loss of public funding without transforming UC into a fully private university. And how UC would make up for its minimal endowments, gain access to its physical plant (owned by the state), or be able to compete with leading private universities is unclear. To say nothing of how it would recover from the loss of its soul. The only way to save the university, then, is to regain public support and state funding. Regaining state funding will not be easy and it will not be immediate; no one believes otherwise. Indeed, we should recognize that the present crisis is real and that the next several years, at least, will be difficult. As we all know, cuts have been imposed and more are coming. It is because of the depth of the problem that the abdication of UC’s leadership (both in UCOP and the System-wide Senate) is so devastating. By pretending that there are funding solutions without state reinvestment, they enable the Governor and his allies to dodge the full responsibility for their actions. And by failing to make the full economic, ethical, intellectual and political, argument for public education and for public investments they help ensure that students will receive lesser educations in the future and that the state will suffer the consequence. The tragedy here is that in their embrace of a failed funding model and their depiction of faculty and staff as dinosaurs from another age they denigrate the institution that they are charged to protect and serve. Again, President Yudof’s off-handed comment that the “shine” is off education is all too typical of a lack of confidence in the very institution that he is charged with leading. Californians have, for decades, taken great pride in their institutions of higher education. It is the recent transformation of the universities into corporate like entities whose main concern seem to be revenue streams rather than teaching, research, and service that alienates so many of the public. Students are trained into debt rather than disciplines; they are driven into fields because of economic pressure rather than curiosity. And in the end, they are not even guaranteed a job. But UCOP seems unable to draw upon that long-standing pride. Appearing more as managers of a corporation than educators of a generation, they simply reaffirm the worst fears of skeptical public. If UC’s leadership truly wishes to save the University they cannot do so by pretending that there are private funding streams that can preserve the University or, indeed, by thinking about UC alone. UCOP, of course, needs to intensify efforts to work with the leaders of the CSU and the CC’s to make the case for the necessity of higher education to the state. But even this alliance will only get part of the way towards ensuring education into the future. The state faces an ethical and political crisis—one that is based upon the question of whether or not we plan to sacrifice or educate and nurture the young. Higher Education cannot survive in a context where children are denied health-care, child-care, or education unless their parents are wealthy enough to provide them. Higher Ed leaders must draw upon the prestige of their institutions to make the public case not simply for higher education but for broader public investment in the future. They cannot do this overnight—nor can they do it alone. There is no guarantee of success. Saving the University by helping to transform California’s political culture will necessitate genuine change in the attitudes of UC’s leadership—most importantly they will have to break their complicity with the right-wing forces in the state government (most evident in their embrace of the Governor) as well as curb the power of finance capital in the running of the University. They will need to stop insisting that the University can do without increased state funding. And they will need to turn their backs on the hybrid funding model that has brought us to this crisis. But if they do not attempt to do so, they cannot complain when the History of the Decline and Fall of the University of California treats this moment as the strange defeat of the University. So reported the Chronicle yesterday, with supposed savings of $500 million. The changes involve procurement streamlining, increased software compatibility, etc. It is presumably Regents item F3, but as of this posting there are no public materials to review. UC has been talking about things like regularizing computer systems (e.g. for payroll) for 20 years. The obstacles have been No Coordination - these are complicated operational problems that require long-term effort from UCOP - and No Money. It's true that campus offices don't like unfunded mandates from on high, but contrary to CFO Taylor's remark, there is no "cultural" support for outdated and incompatible software and for five layers of procedural checks. On the other hand, there is a need for central administration finally to follow through on their talk, which will also entail that they not foolishly imply at the start of a process that the campus personnel who will implement any changes have been causing the problem by dragging their feet. Several of UCOP's most vocal figures now routinely address everyone below the rank of senior manager with a reflexive, defensive, arrogance that makes them look pretty silly while reducing the chances that even worthy programs will succeed. Some persons of a desponding spirit are in great concern about that vast number of poor people who are aged, diseased, or maimed, and I have been desired to employ my thoughts what course may be taken to ease the nation of so grievous an encumbrance. But I am not in the least pain upon that matter, because it is very well known that they are every day dying, and rotting, by cold and famine, and filth, and vermin, as fast as can be reasonably expected. And as to the younger labourers they are now in almost as hopeful a condition. They cannot get work, and consequently pine away for want of nourishment, to a degree that if at any time they are accidentally hired to common labour, they have not strength to perform it; and thus the country and themselves are happily delivered from the evils to come. In his May Budget Revision Governor Schwarzenegger, unlike the projector in Swift’s famous satire, does not suggest that we eat the children of the poor—at least not literally. Instead, the May Revision plots out a path where the poor, the sick, and the young can be slowly disencumbered of necessary public support and left to their own resources in a recession-racked economy. The Governor and his republican allies have made the decision to place the burden of balancing the budget on those least able to bear it. We need to be absolutely clear about this point. While the May Revision insists that it is a “reflection of … the difficult and necessary changes required to address this year’s budget gap” (MR, 5) it is nothing of the sort. Instead, it is the result of a decision to protect the interests of the wealthiest Californians and of large corporations at the expense of the rest of the state’s population. Typically, the Governor blames everyone but himself for the budget mess: no mention of his pandering rollback of the vehicle registration fee that set revenues back billions of dollars; no mention of the long-term decline in corporate taxes and the shift of tax burdens onto wage-earners; no admission that his own refusal to sign into law changes the legislature had passed at his urging (because they were not everything he wanted) had worsened the situation. Instead, the problem lies with Courts that uphold the laws, workers who expect to get paid, and legislators who don't follow him like children after the pied piper. 1) The Governor and his Republican allies have made it clear that they will not accept any tax increases. Arnold opposes an oil severance tax that might raise over 1.3 billion dollars and which all other oil possessing states, including Sarah Palin’s People’s Republic of Alaska, have imposed. Moreover, he indicated that he won’t roll-back the corporate tax breaks provided to selected corporations as part of political deals in 2008 and 2009—tax breaks that are costing the state billions of dollars in tax receipts. The refusals to impose an oil tax or repeal these corporate taxes are not, we should be clear, designed to benefit the working or middle-classes. The Governor’s willingness last year to agree to a sales tax increase (the most regressive of taxes) showed where his true loyalties lay—with the wealthiest and most powerful amongst us. 2) Instead of considering tax increases, the Governor has decided to raise fees and limit eligibility to Medi-Cal recipients as well as those in the Health Families Program, eliminate the Cal-Works program, cut funding for In-Home Services for the Elderly, and shift funding for some Food Stamp and Child Welfare Services onto Counties. (MR, 21-26) Just so we are clear who the Governor is targeting with all of his cuts it is not simply the poor in general but the elderly and the young. To take only one point: over ¾ of the Cal-Works recipients are children. 3) The Governor claims that he is meeting the Proposition 98 funding level for K-12 schools. Technically this may be correct, but we should recognize that it is the result of a series of sleights of hand. For one thing, the Governor also proposes eliminating “the remainder of state funding for need-based, subsidized child care totaling almost 1.2 billion” (MR, 41) (which lowers the overall budget and consequently funds for schools) and has proposed a swap involving gas taxes between the general fund and special funds which will lower the Proposition 98 funding levels. 4) The Governor is proposing that all state civil service workers take one furlough day a month with the resultant downward effects on wages. 5) As you all know the Governor has promised to increase funding for Higher Education in this budget. Several things should be said about this. First, the Governor’s proposal does nothing about the recently passed fee increases—they remain in effect at both UC and CSU. Second, the proposal effectively fills up some of the cuts from last year—it doesn’t address needs for growth. Third, while the budget for 2010-11 is larger than for 2009-2010 the Governor has lowered the proposed funding between January and May. There is political calculation here, of course. As Robert Cruikshank has argued over at Calitics the whole political point of this gambit is to divide the different Democratic constituencies. Arnold knows that he will not be able to eliminate all of these programs. In response he will then cut Higher Ed and blame the Democrats. The middle-classes, faced with rising fees, will become even more disenchanted with the Government and the wealthy and the large corporations will laugh all the way to the bank. The Governor’s budget pits Higher Ed against services for the poor and the elderly; universities against children; and the middle-classes against the working-poor. By pitting the middle-class against the working class and the poor, the Right (and that is who Arnold represents) hopes to continue their long attack on any notion of a common good ensured through the public realm. Even more insidiously, the May Revision implies that the only budgetary option is to choose among different ways to cut the state’s investment in the young. California has long been noted for its willingness to pay more to lock someone up in prison than to educate them at college. But under cover of the budget crisis and the recession, the Governor is proposing to sacrifice the young by undermining, and in some cases, destroying a whole range of social institutions: childcare, schools, health care, job training, colleges and universities. And all to protect the tax breaks of those who need help the least. In effect, The Governor’s proposal condemns the future to protect the past. This point seems to have escaped UC leaders in their rush to thank the Governor but it should not escape us. Against the politics of Arnold we need to support a politics of investment in the future; saving the University means reinvigorating the larger public realm. The Berkeley Faculty Association has released a report on the preliminary UCOF recommendations and Dean Edley's apparently undead proposal for a Cyber-campus. Please take the time to read it. It offers a very important take on where UCOF may be leading the University and just as importantly indicates that, in the face of insufficiently quiescent working-groups, UCOP has decided to circumvent its own Commission and make "reform" proposals over the summer. UCOP, of course, is assuring everyone that any proposal will pass through the Senate but given the manner in which Divisional Senates are being asked to respond to the first round of UCOF proposals (as many of you may have seen senate committees have been given pre-fab response sheets), these assurances are not particularly re-assuring. Please use this post as a space to report on the review process on your campuses as well as to respond to the BFA report. In the past 10 days I have lectured at San Francisco State, at the University of Washington, and at half of UC's campuses. I have had the pleasure of spending several hours at each place with faculty and staff who are trying to keep things one their campus from getting worse, and picked up a few repeat issues. No expansion, all contraction. Like Herbert Hoover before them, the governors of the Western states are focused exclusively on deficit reduction. There is no other goal of governmental policy than to spend less money tomorrow than the amount we spent today. Reflecting the general paralysis, not a single person I met was discussing a stimulus push. UC, CSU, UW, et al should be demanding an economic stimulus and rebuilding strategy in which they would play an important role, but this is off the table. I wondered more than once if we will be remembered in future decades with the same mix of pity and contempt we reserve for contractarian goats like Mr. Hoover. "We'd protest, but we're late for work." One student activist said the students most in need of stable public funding are working two or three jobs, usually adding up to close to 40 hours a week. "In the 60s, there was time to think, to go to meetings, to participate politically." Students are as active as ever, she said, but given time constraints and other ties tend to do politics in their communities, where things are just as bad. Backward Budget Policy. In general, administrators still treat the budgetary structure of our common institutions as proprietary information, to be retained or dribbled out at their discretion. Virtually everyone I spoke to is resigned: there isn't enough time in the day to ask for every spreadsheet six times or even to request a single number like the base figure to explain the percentage cut represented by a number that just appeared in a memo. A few Senate folks have deep knowledge of parts of the budget. There is an active transparency project at UC San Diego (displays correctly upon download). This is important work. It is also the exception rather than the rule. And it means enormous duplication of effort and reduced personal effectiveness for the faculty members who are forced to play spreadsheet hide-and-seek in order to understand their own institutions and provide creative input. This is not behavior required by healthy institutional cultures. Decline of educational quality. I heard examples at each campus. The chair of one top-5 engineering department described cuts in the number of required laboratory courses their majors took, and growth in the size of each lab group in the remaining courses. He then said that a company that hires 40-50 of their graduates each year told him that "the quality of your graduates has been going down for three years now. They're smart, but they have less experience and need more help." At another campus, a social scientist told me, "As my courses get bigger, I focus on signing-in, test recording, attendance, and behavior. It is increasingly like teaching high school." Moribund reform processes. No one suggested the Commission on the Future might come up with useful suggestions, or had much good to say about the first round recommendations. Expectations of UCOP are at an all-time low. Few people seem to assume that UCOP is working for rather than against the campuses. Folks had an easy time listing UCOP destabilizers of the system - operating cuts, salary cuts, pensions put in play, faculty role in instruction questioned, unions disrespected - but no services or supports. Ending the system. For the first time in my experience, at least one person at each campus asked me whether I thought breaking up the UC system would be a good idea. Sometimes it was to get Campus X free of the burden of the other campuses. Usually it was to free Campus X from the burden of UCOP. We have moved rapidly away from the "Power of 10" mantra of past years, and people are desperate enough to be considering divorce. Braced for further decline. this was the dominant mood, although everyone was looking for a way out. My lectures have been trying to propose a way forward and I've been heartened by the intelligence and energy of the discussions. Community bridges, public service. Individuals and groups are doing wonderful things for California communities. Cal State's Metro Academies Initiative was one standout. Great people and great work are everywhere on our campuses. So how can we make our university systems greater rather than less than the sum of their parts?